Virginia Avenue is hopping with new developments. 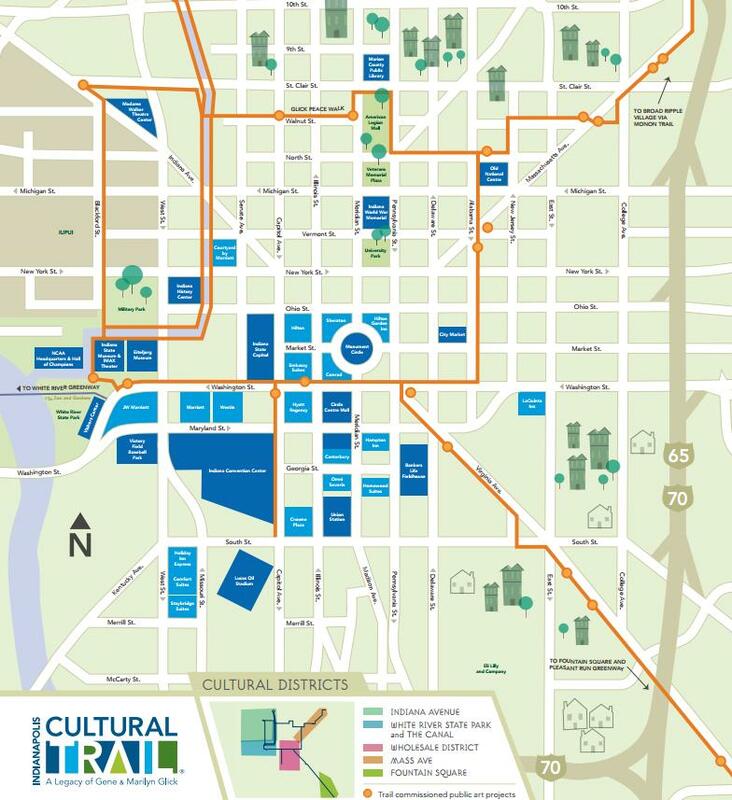 Each article and news report that is written about the renewed focus on the street has mentioned the Cultural Trail as major catalyst for the revitalization of the street. The Cultural Trail is parallel to the commercial district for almost the entire stretch, with the exception of the short jog it makes to enable easier crossing of East and South Streets. The Cultural Trail planners went out of their way to preserve street parking along Mass Ave, which is perpendicular instead of parallel. But I have to wonder if the backers of the street shot itself in the foot a bit by housing the trail on peripheral low-trafficked streets and alleys, instead of creating a more direct link to downtown. I’m curious to hear thoughts on this issue, and what you think the future might hold for each neighborhood. Virginia Ave was a bit more of a “blank slate” enabling the direct link to DT.. While it would have been amazing to do the same on Mass Ave, I would imagine the cost of converting it would have been much higher.. If it had been proposed, you would have been able to hear the people crying about parking from space. Otherwise the trail is zig zagging through a fairly well established area that doesn’t need a lot of help.. While FS/FP development has boomed and it needed something like the CT to help with that. As to losing parking, it has been included the long range plans for years for Mass Ave to be converted to parallel or reverse-angle spots, so that may happen regardless. But, yes, it does go to show that once parking is provided, it is tough to go back on it in the future. Kevin, the reality in Indianapolis is that when there are attractions or attractive locales for businesses to blossom, people will drive to them from other parts of town. This is especially true of restaurants, which might have 20 tables and need parking for 30 cars when they are approaching capacity. We have to put the guests’ cars somewhere. Not enough people live close enough to support downtown’s amenities by walking or biking to them. Then why has Virginia Avenue been able to attract a large number of restaurants? There can’t be much more parking there. The reality is that the quantity and quality of FS restaurants was so low for so long that parking was never an issue before. As the following of the new restaurants grow to people living outside of FS, the business owners will bring up the parking issues (as the established owners did during the construction of the Cultural Trail). Part of the answer is proximity to Lilly for lunchtime business. Part of it is a few small public lots scattered throughout the area. But I suspect most of the answer is in the large off-street lots between Shelby Ave. and Family Dollar and Bud’s and behind the old Deano’s Vino…almost three blocks of parking lots. On Prospect, there’s a closed fast-food joint across from Santorini. There are other vacant buildings with parking scattered throughout the district, but increasingly the new development is built on disused parking lots (The Mozzo). I live in Cottage Home and ride to the City-County building every day. It would seem counter-intuitive that the Mass Ave section of the Trail is faster than staying on the Ave for the straight shot….but the Trail is just as quick and much more pleasant. I usually get behind other riders at College/St Clair/Mass and when I ride down the Alabama leg approaching Vermont, the riders that stayed on the road are only a few pedal strokes ahead. The Trail allows me to avoid stop lights at East St and New Jersey. Because Mass is a break in the grid the lights are not timed for continuous flow…which is a good thing in my opinion. The Mass leg also serves the IPS CFI 2 at North and New Jersey. I am behind kids and families that ride or walk to school every day. I was skeptical at the very beginning….but now am a huge advocate for the routing. I like the point about the Center For Inquiry. Speaking from the cyclist perspective, perhaps they didn’t feel compelled to run the CT along Mass Ave because it’s already a fairly calm road that is easy to ride a bike along. I would advocate for reverse angle parking, and speed humps (not speed bumps) to keep the car traffic at a reasonable speed. Cars really feel speed humps and they work great at keeping car speed down, while cyclists barely feel them at all, if they’re done properly. I wish we would make more use of them (as well as the bike blvd concept) in Indy. Perpendicular parking is treacherous for both drivers and cyclists. Reverse angle parking wouldn’t even take away many parking spaces, but it would free up some precious sidewalk space for pedestrians and outdoor cafes. In addition, it would be safer than perpendicular. I think that would be a good way to go, if the Cultural Trail continues in its current configuration. But I still think parallel parking would not be a disaster for the local restaurants. People tend to gravitate towards vibrant places with wide sidewalks, and will find a way to visit those places. I couldn’t agree more about how horrible perpendicular parking, or even forward angle parking, is along a public street. I was excited when the CT was first announced, because I thought it would provide the opportunity to convert to either parallel parking or reverse angle parking on Mass Ave. I was pretty disappointed when that didn’t happen. Although the chosen CT route seems to work pretty well for bicyclists, as others have pointed out, I still think Mass Ave would benefit greatly from pushing the curbs out (or would it be pulling them in?) to widen the sidewalks. 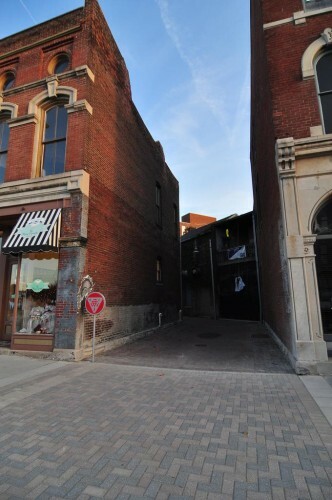 I find nothing quaint about stumbling along the super narrow sidewalks, such as near the Chatterbox or south of Bazbeaux. Even though I often drive there, I’ve never considered not visiting Mass Ave because of parking difficulty, and still wouldn’t if some parking spaces were lost (just like BR or FS), but I do get more frustrated by the narrowness of the sidewalks and the necessity of blindly backing out into traffic to exit the Mass Ave spots. Generally, I park on the side streets. Oh, good! Another post where I can ramble on about turning Mass Ave into a pedestrian/transit mall. The interesting thing is, as Ben pointed out above, Mass Ave didn’t really need much help from the Cultural Trail, unlike Fountain Square and Fletcher Place. However, when I’ve said that Mass Ave should be a pedestrian/transit mall in the past, the argument was that it wasn’t vibrant enough. As for the “specifics”, I would love to see all the east-west and north-south streets stay connected as grid, have bus only lanes down the middle where the two driving lanes are currently, and have all the parking converted to sidewalks and outdoor dining/shopping/whatever. The parking lost would be replaced by a garage or two. Maybe do this from College down to Vermont, and then have the ped/bike way continue on Vermont over to IUPUI. I know turning Vermont into a pedestrian and bike way has been talked about before. In the meantime, I would be happy with reverse angle parking and more generous sidewalks as the ones there currently get crowded once people are walking two ways on them in some spots. As for the routing of the Trail, if I am biking with my kids and/or wife, I take the zigzaggy trail but when I’m alone, I always take Mass Ave.
With all of the side-streets near Mass Ave, I think it’s relevant. It is SO hard to get shopowners to realize that removing parking to encourage bikes and pedestrians counter intuitively allows a ton more people access to your shop, if done in the right neighborhood (like Mass Ave). I’m in Copenhagen right now and I’ve never had that fact so vividly illustrated as what I’m looking at right now. Their downtown core is almost completely car-free. As a result, there are swarms of people walking and biking up and down the streets…probably 10x people-traffic than would be possible if it were car oriented. Not a single vacant storefront, and all of the businesses seem to be thriving. It’s just tough to get business owners to think beyond their experiences, and look beyond those 2-3 car spots in front of their shop. I generally support lane reductions and limiting parking, as appropriate. However, I also believe that such decisions about changing the streetscape need to be grounded in the reality of the local environment where they are to be made. Copenhagen is a beautiful city, but it is absolutely NOTHING like Indianapolis, either in its built environment or local culture. Indianapolis is one of the least dense cities in the U.S., and for generations it has also been a very automobile focused city, more so than most U.S. cities. Even places like Salt Lake City have better public transit than Indianapolis. Turning downtown Indianapolis, or just Mass. Ave, into an almost car-free zone would mean turning it into an almost people-free area. First, focus on the built environment (i.e. significantly upzone the city and mandate more pedestrian friendly design in new construction) and provide better public transit, and then you can change existing parking patterns in older neighborhoods. There isn’t the density for Mass Ave to succeed as a ped mall and it frankly doesn’t need to be, but some side streets could be improved and I’ve always thought Alabama being one way is a huge hindrance. The heart of Fountain Square might be an even better option for a pedestrian mall. Let automobile traffic circulate counter-clockwise (like the Indy 500) along S Morris, south of the FSQ building, to Prospect, W on Prospect to Shelby, N on Shelby to Woodlawn, W on Woodlawn to St Patrick, S on St Patrick back to S Morris. Then close the intersecting roads that are encircled (part of Virginia, Shelby, and Prospect). Service access to every business is maintained. 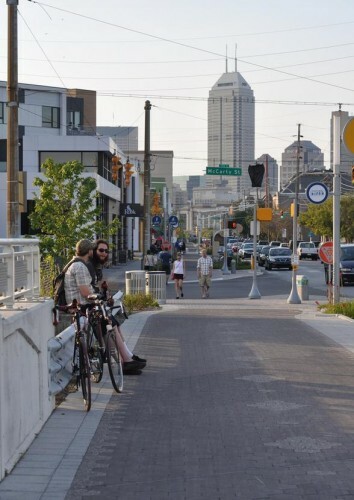 An enormous amount of asphalt could be reclaimed and turned into green space, more fountains, and wider pedestrian paths-and in doing so could further propel Indianapolis (with the help of the Cultural Trail) to a position of leading efforts to reclaim pedestrian-centric urban areas. A well-designed multi-level garage could ease the pressure for those visitors from the suburbs to come and enjoy a meal or a show or some duckpin bowling. People living too far away to bike or walk could utilize one of the many cab services, which is what bigger cities embrace. IUPUI, lack of housing for hospital uses obvious missed opportunities. What was Virginia Ave Jazz district is mostly gone. I think you meant Indiana Ave, not Virginia Ave.
A Mass Ave. pedestrian Mall is completely unrealistic…and would hurt business. Indy won’t have the density in 50 years to achieve ANY pedestrian mall. Havn’t we learned a lesson from the 60s and 70s? Philadelphia, at the time the fourth largest city in the US, had a pedestrian/bus mall downtown in the early 70s. It was gone by the 90s. If a city with that kind of density and transit infrastructure can’t support a downtown pedestrian mall, there’s no way a city like Indy ever could. I have a question unrelated to this really, does anyone know what is going on with the building at the corner of prospect and e morris st? they tarred over the mural there and now have a little sloping metal structure and two doors added, is it becoming a restaurant or something with an outdoor cafe area? Here’s the article about that building. Kevin – I think Tyler may be referring to Kuma’s Corner, not the Pioneer Italian restaurant. Kuma’s Corner is a heavy metal themed burger joint with two other locations in Chicago. It’s very highly ranked among Chicago’s burger restaurants. I think the black paint over the former mural is to go with the heavy metal theme. The dug up area going to be an outdoor patio area. That’s right. Thanks for the correction Eric W. It has been a while since I’ve been down in FS.